"[Suspiria is] Dario Argento's film, and it's impossible to remake this film. But if I accepted [the role] because it will be a completely different movie! It's inspired by the same story, but it goes in different directions, it explores other reasons. It's semantics, of course, but I think people really have to understand that this is not a remake, because the word "remake" gives the impression that we want to erase the original, and the opposite is what we try to do." "I think people are going to be really pleasantly surprised to realize that it's really not a remake at all. I think people are going to be really shocked. It's a nod of the hat to Dario Argento and his version of Suspiria, but we really do take it to a completely different place." While the folks at Amazon Studios are doing a remarkable job of keeping key plot points under wraps, several major differences between Guadagnino's remake and Argento's original are already glaringly apparent. 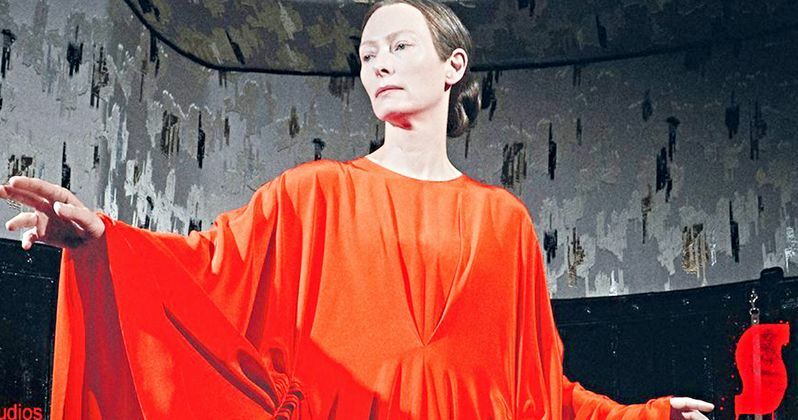 For starters, the color pallet is surprisingly muted; one of the most prominent aspects of 1977's Suspiria is a hallucinatory kaleidoscope of near-neon splashes and splatter, while Guadagnino's iteration sports subdued earth tones. Then there's the runtime: Suspiria 2018 will clock in at an impressive (and somewhat intimidating) 2 hours and 32 minutes; the original Suspiria, by comparison, is an industry standard 92 minutes. In addition to Swinton and Goth, 2018's Suspiria stars Dakota Johnson, Chloë Grace Moretz, and Lutz Ebersdorf. Jessica Harper, star of Argento's Suspiria, will be making a cameo. The film enjoyed its world premiere during July's Venice Film Festival where it received great reviews and reportedly moved filmmaker Quentin Tarantino to tears. Suspiria will also marks the first theatrical release for Amazon Studios, a move that takes the entertainment titan out of its digital comfort-zone and into a turbulent yet potentially profitable new arena. If Suspiria strikes the right chord, expect more feature films by Amazon to hit theaters in the future.